Leizhan culture paper making machine can use Virgin pulp, Recycled paper, De-inked pulp as raw materials to make high-grade Printing and Writing paper, A4 paper, A3 paper, Carbonless paper etc. Apart from printing and writing paper production machineries for the complete printing and writing paper processing project, Leizhan also provide tailored and innovative culture paper making solutions for paper plants. The whole printing and writing paper processing trun-key project can be devided into two sections: printing and writing paper stock preparation project and printing and writing paper making project. Paper equipments contained in the Printing and writing paper pulping project: Chain coveyor, PLC control drum pulper, high density cleaner, mid consistency pressure screen, reject separator, Multiple stage flotation deinking machine, low density heavy impurities cleaner, high speed washing machine, double disc refiner, etc. 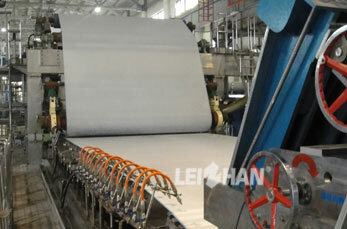 The width of Leizhan writing and printing paper processing machine range of 1880-3750mm. With operating speed range of 200-1200m/min, the production capacity of cultural paper making equipment will be 20-270 tons of fine, carbonless cultural paper per day.